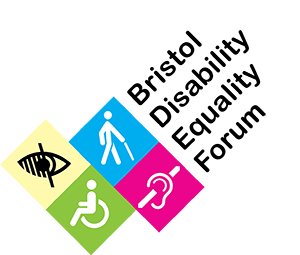 Our vision is for a society where Disabled people are respected and valued, where they have Independence, Choice and Control of their own lives, and where they are fully included in their communities and the country as a whole. As part of this, we follow the principles set out by the Disabled people’s movement that there should be “Nothing About Us, Without Us”. To achieve this we are active in most aspects of Disabled people’s lives where they face barriers to being an active and valued member of their communities, the workplace and the wider environment, including Transport, Social Care, Housing, Health, Built environment, Neighbourhoods, Hate Crime, Employment and Welfare Benefits. The Forum also offers a range of services to statutory and voluntary sector organisations. These include training, undertaking Equalities Impact Assessments, policy advice and event organising. All this work is done using highly experienced personnel. For further information, go to: About Us/Services to Statutory and Voluntary sector.